Women have played a major role in the fire service ever since the 1800’s when a slave named Molly Williams served as a volunteer firefighter in New York City. Today, African American Women play a significant role in the fire service nationwide. Currently, 5 African American women serve as Fire Chiefs of municipal city and county fire department’s across the United States. Here in Los Angeles, the beginning of African American women in the fire service started in 1978 when Carlesta Wells became the first African American woman paramedic hired by the Los Angeles Fire Department. She was followed by Michelle Banks in December of 1984. In 1984, Bridget Burke became the first African American woman to be hired as a firefighter in the city of Los Angeles, unfortunately she was terminated in the academy. Later on that same year, d’Lisa Daives, a veteran of the United States Army, was successful in completing the academy and her one year probationary period, thus becoming known as the first African American woman to serve in the Los Angeles Fire Department. In 1988, Tonya Lee Burns became the first African American woman firefighter to be hired by the Los Angeles County Fire Department after serving with the Oxnard and Inglewood Fire Departments. She was followed by Veronie Steele-Small who came on the Department in the next class that same year. Crystal Golden-Jefferson and Gloria Altemus became pioneers when they were apart of the early class of women that were hired in the Inglewood Fire Department in the late 1980’s. 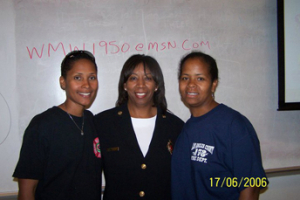 Sheila Hopper became Compton’s First African American woman firefighter when she was hired in 1986. Yvette McDowell became the first African American woman to serve as a single function paramedic in the city of Pasadena when she was hired in 1980. She was followed by Gina Thomas who became the first African American woman firefighter for the city of Pasadena when she was hired in 1990. And sadly, in 2004, Jaime Foster was the first woman firefighter to be killed in the line of duty in Los Angeles. She was an African American and only on the Department for less than a year when she was lost in an on-duty related accident. There are many women serving in the fire service today as chief officers, company officers, dispatchers, arson investigators, training officers, paramedics and fire chiefs. To learn more about these Brave and Beautiful women log on to the Black Women in the Fire Service website at www.bwfs.org. The African American Firefighter Museum is proud to acknowledge that our first President was Firefighter/Lead Paramedic Michelle Banks of the LAFD. Firefighter Banks was instrumental in the opening of the Museum. She served as President from 1997 to 2003. She has been named President Emeritus of the African American Firefighter Museum.